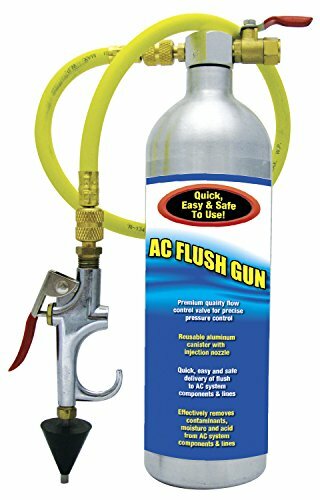 Supercool flush gun with flow control valve and improved spray head should be attached to a shop air compressor for maximum pressure and effectiveness. The featured flush cylinder can be pressurized for use even without the air hose attached. A simple, economical tool, it effectively removes contaminants and old oils and fluids from the air conditioning system in your car or truck. The improved spray head reduces spray back and offers a steady spray to ensure complete work. Supercool is a basic provider of A/C chemicals including PAG and POE lubricants, flush, ultraviolet leak detection dye and polymer free leak stops. Supercool offer one of the most complete A/C maintenance programs in the marketplace today. Supercool lubricants are formulated with the finest base stocks and additives available today resulting in highly sought after performance qualities. Outstanding oxidative and thermal stability, helping to extend fluid life. High viscosity index resulting in decreased volatility and enhanced protection. Excellent protection against wear, rust, corrosion, carbon build-up, and varnish. Enhanced resistance against water contamination compared to competing products. Supercool customers receive industry's leading technology in all fluids with lubricants and UV dye's formulated to meet or exceed OEM performance specifications. In addition, all lubricants are top-off compatible with their corresponding OEM and aftermarket equivalents. Designed for real-world operating conditions, they provide an unsurpassed level of service, performance, protection, and fluid life. If you have any questions about this product by TSI Supercool, contact us by completing and submitting the form below. If you are looking for a specif part number, please include it with your message.